"You can use cheese or meat ravioli in this recipe. Sausage ravioli are particularly good!" 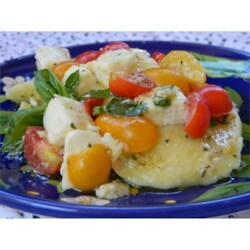 In a large bowl, toss together the cherry tomatoes, mozzarella cheese, basil, olive oil, garlic, parsley, salt, and pepper. Let stand about 1 hour. Bring a pot of lightly salted water to a boil, and cook the ravioli about 5 minutes, until tender and heated through. Drain, and toss with the cherry tomato mixture to serve. Prepared cheese ravioli simmer in a flavorful tomato sauce. Not a whole lot of flavor. We were trying to go lower cal but ravioli really just needs a sauce, not just an oil. We won't make this again. Very yummy and light. Nice I loved how fresh it tasted!